LOSE IT Magazine 4th Issue for new ideas & inspiration! 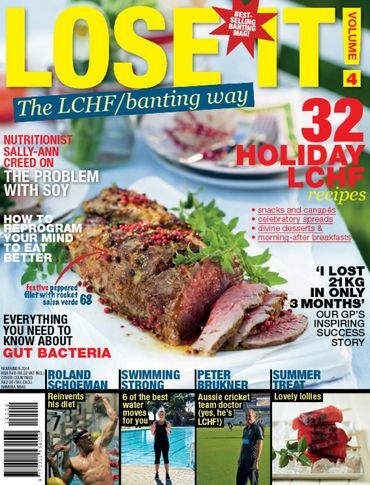 LCHF 4th issue of the Digital Magazine ‘LOSE IT’ is available. I post this reminder, since there are a few of my friends, who forget to look out for it, and when they see the post, it’s an ‘AHA’ moment, for them. I’d also like to advise, that I am in no way affiliated to this magazine, I simply find it inspiring to hear others success stories, read more information about LCHF, as well as to see what others creatively cook & bake in terms of LCHF food. Thus, I share this with you all. And since it’s digital, anyone can buy it globally! To purchase, click on the following links and follow the instructions….it’s truly easy! Alternatively, if this doesn’t work for you, go into the search engine you use, and type in ‘lose it digital magazine’, this should provide you options within your country of how to purchase!